Driving end of 2-car unit of C Stock as delivered in 1970. This was the first stock on the Underground to have four sets of double doors per car side and air operated, sliding cab doors. The cars were designed for the heavily used Circle Line and they needed specially deep solebars to support the four wide door openings in the car bodyside. 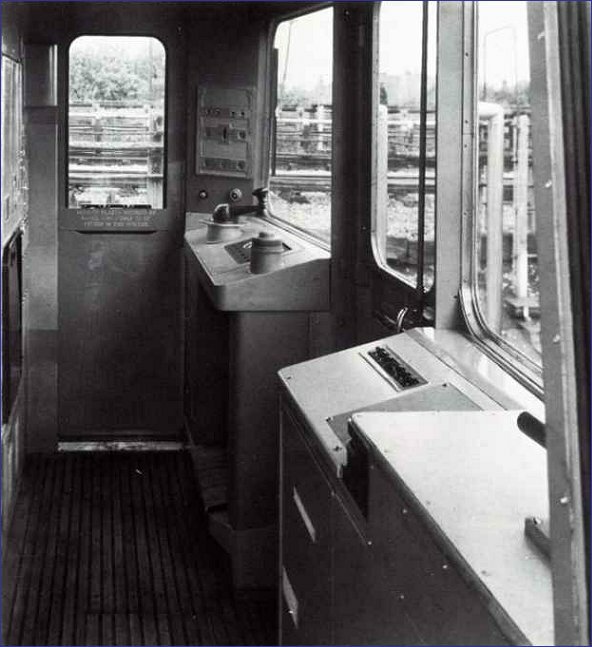 The drivers cab door also had pneumatic air seals, designed to seal the door to prevent draughts when it was closed. They often failed and were removed during refurbishment. Another new feature of these trains was that they were equipped with air suspension. The "Metacone" suspension units kept the car floor at the same level regardless of load by increasing or decreasing the air pressure while the car was at stations with the doors open. The air signal was used to adjust acceleration and braking according to load. The system was removed during refurbishment and replaced with plain rubber suspension units. 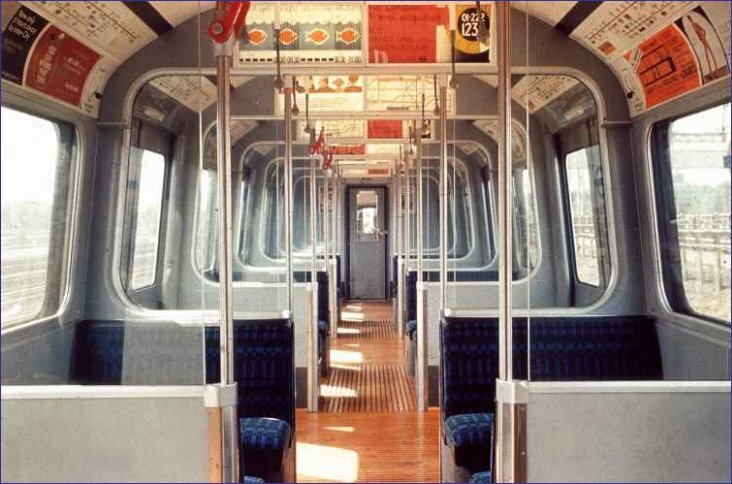 The interior of the C Stock as originally delivered into service. Apart from a pair of seats at the trailing ends of cars, all seats were transverse, with a pair on each side of each doorway. All were protected by draught screens. Note that car ends were originally without end windows. Some of the vertical handrails on the left of the picture have the old type of red emergency handles. These act directly on the train line pipe (as the brake pipe is called on the Underground) so that, if operated, the train stops. There was no warning for the driver and no override to allow the train to be driven to the next station. The system was much abused by hooligans and led to the present arrangement being adopted. The floor is grooved maple wood, used by the Underground since the 1920s until the early 1990s. In its original condition, it was varnished to give it the beautiful golden finish seen here. Needless to say, it didn't last long like that in service. Smoking was allowed on Underground trains until 9th July 1984. Before then, some cars were allocated as "NO SMOKING". On the C Stock, two trailers on a 6-car train were "smokers", so the third trailer had to have "NO SMOKING" signs on the windows. These were removable so that the correct signs could be displayed when trains were reformed. Small plastic brackets were glued to windows to carry the signs if required. The C Stock originally had internally illuminated advertisement frames, mounted across the car at each draught screen, as shown here. The idea was imported from the 1967 Tube Stock, as a means of increasing advertising revenue. These were removed at refurbishment, the cost of maintenance virtually eliminating the extra revenue. The original C Stock bogie. It had steel side frames and aluminium headstocks. The primary suspension was the traditional (by then) London Underground chevron shaped rubber blocks mounted in cast aluminium yokes, bolted on the inner ends and fitted with variable slots at the outer ends. The shoebeam was hung between the axleboxes. The rope operated shoe lifting gear can be seen where the rope is supported by the end of the bogie bolster. The bogie bolster has two, large, widened ends where the secondary suspension units were mounted. The were combined rubber/air cylinders known as "Metacones". The air pressure in the Metacones allowed the car to be levelled as the load changed. When car doors were opened the air suspension system was unlocked so that the loading and unloading of passengers could be detected and the air pressure adjusted to keep the body at a constant height. When the doors were closed, the system was locked. The change in air pressure was used to adjust the acceleration and braking of the train so that it could be constant regardless of weight. The Metacones were a maintenance worry and the bogies themselves were weakened by poor track conditions over the years. In the early 1970s, the bolsters had strengthening brackets fitted under them where the Metacones rested. The bogie frame design was the same for motor cars and trailers but the motor versions each had two traction motors, as shown here. The trains had 50% axles motored. The bogies frames were replaced during the refurbishment of 1990-94. 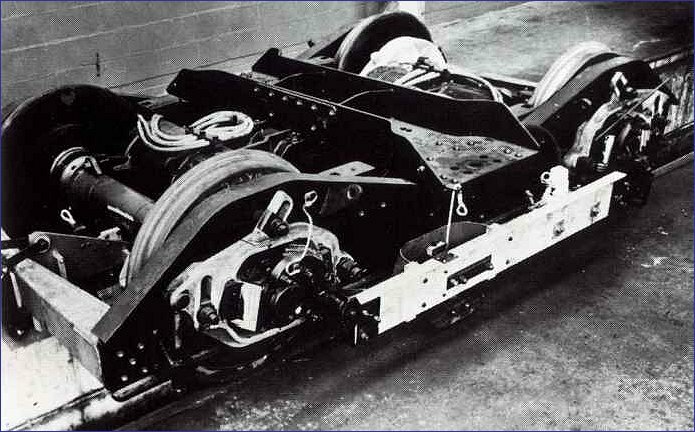 The Metacones were replaces by rubber suspension units similar to the "Christmas puddings" used under the D Stock and the air operated load/weigh system for the traction and braking was removed. Since the mercury retardation controllers of the e-p braking system also allow for changes in train weight, it was really an unnecessary duplication and led to variable braking performance. The C Stock driver's cab in original condition as equipped for two-person operation. The door controls were on the rear wall so that they could be used by the guard working from the rear cab. Note the control desk on the left (far) side of the cab with the combined traction/brake controller (CTBC) locked in the shut down position. Beyond the CT/BC on the nearside corner panel is the whistle and window wiper control. The whistle was moved to the control desk shortly after the trains entered service. The cab side doors are air operated - the first on London Underground. They were also originally equipped with air operated blow up anti-draught seals. Draughty cabs were a constant source of complaint from drivers who had to sit or stand in cold cabs for up to 4� hours. The air seals activated automatically when the door closed and released when it was opened. They were another source of trouble in themselves as they were unreliable and the seals often got damaged. They were removed when the trains were refurbished. The cab was originally designed with future conversion to ATO in mind. This led to some bizarre control positions, including having the cab light switch on the right hand side of the cab. It is the leftmost of the row of microswitches which can be seen on the offside console nearest the camera. The nearside cab door seen here is fitted with side train number plates. This was to allow train numbers to be read as a train passed an optical reader mounted on the tunnel wall at suitable locations. The readers were tried out first on the Piccadilly line in the late 1960s and then on the Northern. It was hoped to fit all lines and the C Stock was equipped with them when delivered. The idea didn't work, mainly because the readers got confused if the numbers were wet or dirty. The plates were soon removed.